One of the many treatments that are normally recommended for neck pain is the usage of cervical traction therapy. In fact using cervical traction device is one of the most effective, natural and drug free way which can help you in relieving the neck pain. DIY Neck Traction Towel: Does It Work? Cervical traction is generally a process of creating the space between the vertebrae which in turn keeps your spinal discs healthy. exercises and stretching recommended by chiropractor, etc. ✓ Manual traction: In manual or mechanical traction therapy the pressure will be exerted either by the physical therapist or by hanging the metal weights. ✓ Electronic traction: In case of electronic traction therapy for neck pain, a pre-designed traction equipment will be available which helps in stretching the cervical vertebrae with necessary weights which are already installed or programmed in it. Taking cervical traction personally or giving the traction to a patient is very easy. The procedure can be easily followed and accomplished using a proper traction device at home. Generally the time duration of a single sitting cervical traction therapy will be 10 to 15 minutes and the number of sittings will be decided according to the condition of the patient by the physician or the physiotherapist. The cervical traction therapy has both intermittent and continuous frequency mode which can be easily applied to the patient according to the severity of the condition. Cervical traction proves much beneficial for relieving/treating many different types of spine or cervical problems. Besides all the best benefits offered, there are certain cervical traction side effects seen. These are mostly seen when the traction device is not used properly or used without the enough knowledge about it. It is worth noting that cervical traction should not be used in case a patient has got a spinal fusion surgery or is suffering from bone problems such as osteoporosis. It is best to get a prior consultation with your physician or physical therapist before you get the help of this therapy. Cervical traction device is an equipment which is used for providing the necessary force of pressure for easing the pain in neck or back caused due to various conditions. The device releases the pressure created in the discs and nerves, thereby helping you ease your pain by providing a stretching action for the muscles and the joints. Using the best home cervical traction device is usually advised by the therapists in case when the treatment is needed to be done at home. People who seek the natural methods of neck pain treatment find this way quite useful. With proper knowledge about using the cervical traction at home they can easily utilize it for getting the permanent relief. Below we list down 5 top recommended cervical traction devices which are best selling in the market. You can find their respective detailed reviews before you consider buying one for treating your condition. This is the best traction device from ChiSoft that is available in the market. It comes with a 3 TIER tube that is unique and that helps in for the faster inflation. For fast relief from the pain it is recommended to use 2-3 times daily for about ten to twenty days to get a long term relief from the numbness in the arms, compressed disc and muscles spasms that are caused by the pinched nerve. The unique three detachable air tubes allows for the fast inflation and safety features and a unique design. It is an easy to use neck stretcher and you just need to place it around the neck and inflate it to the required level using a hand pump and then adjust with a strap. This cervical neck traction device by ChiSoft helps to align the cervical spine and neck by preventing poor posture. Largest pump, Long Velcro Strap, quick inflation and no leaks are some of the basic features of this traction device. Get relief from your pain with Traction services from ChiSoft. ComforTrac Cervical Traction Unit comes with contouring memory foam headrest along with independently adjustable neck wedges for providing the maximum comfort to the user while getting traction. The device includes patented hand pump with quick release button which makes the usage quite easy. You can adjust the angle of incline to your desired level (1, 15, or 20 degree). This home traction unit comes with easy to transport light weight wheeled carry case which makes it easy for you to carry it along with you anywhere you like. You may find this device bit costly but the results it provides can be quite impressive. EverRelief Cervical Traction Device is an effective unit that is meant to give you instant great relief for pinched nerves, cervical radiculopathy and disc herniation. The soft and comfortable fabric with a convenient notch of this EverRelief inflatable neck traction device can give more comfort and relief. You can just relax yourself and reduce your tension and pressure and lead a comfortable life with the help of neck pads. EverRelief home traction unit is considered much better than over-the-door traction units which are most of the times difficult to use. Also this creatively designed cervical neck traction unit is far superior to its competitors due to its safe and effective traction use. With the easy manual and instructions you can use it and take everywhere you travel or go. Pronex Cervical Traction is an easy to use most comfortable device that comes with blue foam cushions to rest on the shoulders. This is over a decade old product which is helping people to cure their pain cycle. Various reviews from satisfied customers reveal that this Pronex unit is efficient enough and has reduced and even avoided the costly pain treatment medications and surgery. You can use it for the pain free enhanced lifestyle. Just make sure that this is the right product that you need, as it is non-returnable once used. This is an excellent cervical traction set by Drive Medical which makes traction easier with its heavy-duty head halter for over door use. The halter includes a metal support; self-attaching closures; a 12 inch adjustable spreader bar; an 8 feet traction rope; double-sealed rings; water bag; and “S” hook. You just need to add the right quantity of water to the device bag for getting the desired level of traction. This pain relieving device is good to use at home or even when travelling. The size is built to fit all and it is machine washable which makes the cleaning at home easy. in fact using the towel is one of the best homemade DIY neck traction method. You need to grab the rope and a small towel. Tie one end of the rope with the towel and simply loop the rope onto the doorknob bringing it back to the other end of the towel and tie it. Lie down on the back with the top of the head closer to the door. Now, rest the back of the head in the sling which is formed by the piece of towel. When talking about the neck traction home units these are mainly of 3 types. Although these work differently, main aim is to provide the relief from the neck pain instantly within the shortest period of time. 1- Inflatable Neck Traction Device: These are also called as Air neck traction devices or neck traction collar. The device is inflated using the pump attached to it. To use it, it is wound around the neck region and slowly pumped to fill air. Fill in air till it stretches to a comfortable level. As the device gets strong, it shifts the weight from the neck downwards onto the shoulders. The pain reduces with relaxing of the muscles and the decreasing pressure from nerves and the blood vessels as well. The discs also come in line so they can hydrate again. The quality of these devices has to be checked properly before buying. As there are devices that wear out too soon and are of very poor quality you need to invest in a branded quality product. Sometimes the pressure applied is not accurate and can be a little too much for the neck and jaw areas. 2- Posture Pump for Neck and Back Device: Posture Pump® for neck pain is of comparatively higher cost than the other two neck traction devices. Made up of highly durable high quality medical materials, these devices are very well-built and powerful. It is said that they mimic the cervical traction that is done in a clinic and the treatment is very much similar to that given by the doctor. However it is much more effective than regular neck traction devices. The person needs to lie down, fit the knobs by adjusting, to hold the base of the skull and then let the straps be placed on the forehead. Once this is done correctly, slowly pump the air in, to let it tighten up to the required amount. 3- Over The Door Cervical Traction Device: These devices require a door for use, as the name suggests. Assembly is required as it has to be hung from a door’s back. The straps of the device need to be tied around the back of the person’s head and also the chin. Tighten the straps by using a cord or something that is available and suitable. Take care not to use anything that can hurt the neck (like a water bag). Place the straps correctly over a firm door and then tie it around the neck, this makes it easier to use. As the device plays its part, the person can sit comfortably on the chair doing his favorite reading, watching television, etc. Cons: There also major disadvantages of this device. They are not as portable as the air neck traction devices, as they need a door to be tied to. The person has to sit on the chair throughout and there is no choice to lean or lie down and relax. The correct stretch takes a little more time here and the chin has to take up most of the pressure from the traction. When compared to the air neck traction devices, these are not simple to use. Based on above advantages and disadvantages you can choose the right type of cervical traction device that is most suited for your body needs and pain. 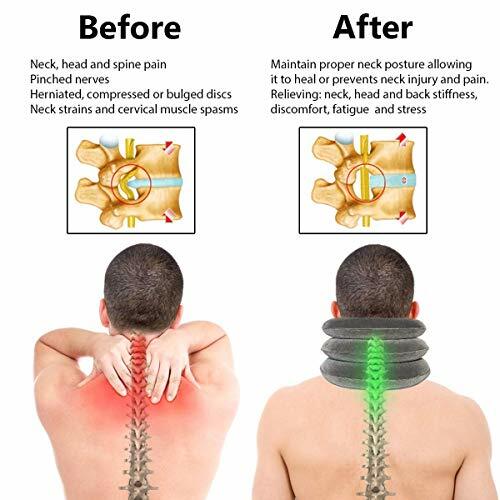 The neck traction is contraindicated mostly in the patients who are suffering with structural disease less important to rheumatoid arthritis, tumor or infection, acute injury process or any condition which makes the movement contraindicated. In that situation, various other cervical traction contraindications are recommended to get relief from acute sprains, strains and inflammatory conditions which may be aggravated with traction. Besides this, various forms of massage, devices and medicines are recommended to treat the problem and ensure better health and safety. Osteomyelitis or bone infection is also a condition where experts do not suggest using cervical traction therapy for pain relief. As a slight pressure to the infected vertebrae region may cause weakness or fracture to the vertebrae bones this method should be avoided. Finally, cervical traction is not recommended to apply to the excessive joint motion or hyper mobility which already exists in the cervical spine. Proper consultation and massage therapy is advised right to support the spinal vertebrae.